Gauss Master Color: Black or Grey How this model works: The meter is activated through one push on the button and　switches itself　off automatically after about 2 minutes. Then you push the button again. The meter can be read in two different scales. From　0 to 10 milliGauss (mG), which　is the most　common way of using the meter. 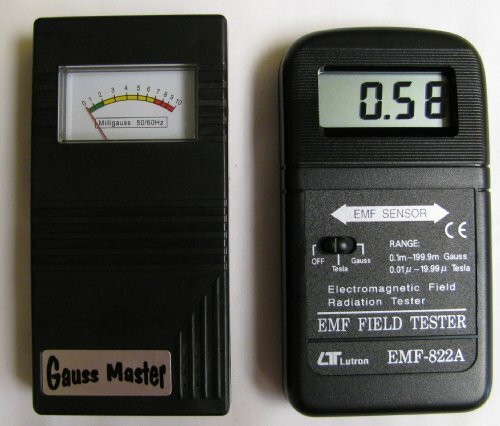 If you want to measure very　subtle EMFs, then hold the button pressed and measure　EMFs between　0 to 1 mG. The meter creates a buzzing sound starting at 2 mG. The buzz gradually changes to a higher and higher pitch. Sound can not be turned off or adjusted in volume (for a quiet EMF meter - see our other listing for the K-II EMF meter). 822A Digital EMF Meter * Measurement Range: 0.1 mGauss to 199.9 milliGauss * Single Axis Measurement * ELF Frequency Bandwidth Range: 30 to 300 Hz * Accuracy: ±4% at 50-60 Hz * High Contrast LCD Display * Affordable accurate precise digital meter! * Certificate of Calibration included. Meter can be read in two different scales. From 0 to 10 milliGauss, which is the most common way.